Is a Dog Smarter Than a Cat? I bet I'm the smarter one. The war between the sexes often pales in comparison with the battle between dog and cat people. Dog people say canines are smarter because they are easier to train, while cat folks say kitties are more intelligent because felines know better than to let us train them. Dogs have bigger and more developed brains, which make them smarter than cats. At least, those are the findings from a 2010 study conducted at Oxford University and reported in AARP. Before you catties have a hissy fit, the study explained that dogs, being social animals, needed to develop bigger brains for survival. Cats, being aloof and solitary creatures, didn’t need to develop their social side. Being social requires some smarts, and it increases brain development, which is the reason dogs were found to be smarter. Dogs aren’t the only species that developed a bigger brain over time, however. Monkeys, dolphins, horses and camels did too — all social species. John Pilley, a retired psychology professor, worked with his border collie, Chaser, who learned the names of about a thousand toys. Not only could Chaser identify all the toys by name, when told to find nine toys in one command, she could do that, too. It takes a super memory and one smart animal to do that. Chaser isn’t the only one. Other border collies can remember hundreds of words, which they can learn quickly, and understand what they represent. Dogs are as smart as a 2-year-old child, according to Stanley Coren, bestselling dog author and psychology professor at the University of British Columbia. The average dog can learn 165 words and can count to five. Their problem solving ability and creativity is more on par with humans than what was once thought, said Coren. Dogs want to please humans. This goes back to their sociability. They watch people and want to learn from them. Brian Hare, assistant professor of anthropology at Duke University, said on a 2011 segment of Nova ScienceNow, called, “How Smart Are Animals?” that a dog is like “a soldier of science.” Dogs show up, are focused and are ready for any challenge people throw at them. Although not as trainable, cats are smart. They are clever and adaptable, so they can survive, even if surviving is moving from sunning at the windowsill to hopping down to their food bowl. However, pampered indoor cats will hunt and fend for themselves with ease if they need to. Cats have learned to survive for thousands of years in radically different environments, points out Animal Planet. They also have excellent memories and, while it might be more difficult, cats can be trained, too. AARP: Are Dogs Smarter Than Cats? 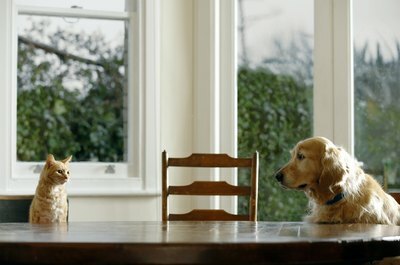 PBS: How Smart Are Dogs? PetMD: My Dog Is Smarter Than Your Child. Really! Is There a Cat That Does Not Have Dander?